Each knot of chain linking SG Family Trust to offshore companies reported to regulators but ownership of London properties not made public. A screen grab of the website of Clivedale, featuring four London projects, including the Indiabull Group’s 22, Hanover Square. Indiabulls, one of the country’s largest realty groups controlled by Sameer Gehlaut, brother Nagendra and father Balwan Singh, made headlines in June 2014 when it acquired a 87444-sq ft property for GBP 155 million at Hanover Square in London. Before Indiabulls Real Estate Ltd entered the UK market, Sameer Gehlaut acquired at least three top London properties through family entities in Karnal, Delhi, Bahamas, Jersey and UK. Currently being developed as residential and hotel projects, these properties are owned by SG Family Trust, set up in October 2012 for the benefit of the family. Perpetual Management Private Limited, trustee of the SG Family Trust, is owned by Haryana Mahila Congress chief and ex-MLA Sumita Singh and her husband Jagdeep Singh Virk, parents of Sameer’s wife Divya Gehlaut. Records of law firm Mossack Fonseca (MF), reviewed by The Indian Express, and subsequent inquiries reveal that the SG Family Trust owns Calleis Infrastructure Limited (Delhi) which, in turn, owns Clivedale Overseas Limited (Bahamas) which again “owns a number of subsidiaries based in Bahamas, Mauritius, UK and Jersey”. Among these are wholly owned subsidiary Clivedale Ventures Limited (UK) and joint ventures Clivedale Properties Limited (Jersey) and Ainsley Holdings Limited (Bahamas). 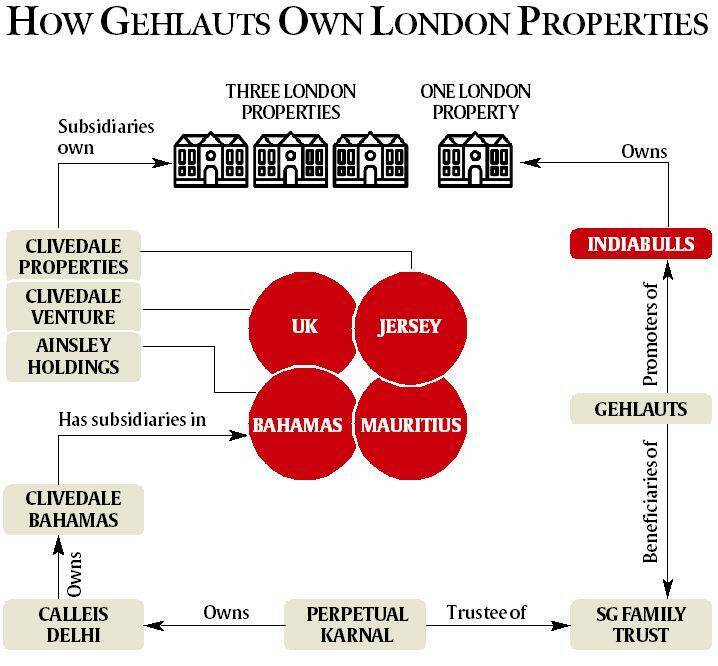 While each knot of this ownership chain that connects the SG Family Trust, registered at the Karnal address of Gehlaut’s in-laws, to companies in Jersey, Mauritius and UK via Delhi (Calleis Infrastructure) and Bahamas (Clivedale Overseas), has been duly reported to the regulators, the Gehlaut family’s ownership of the London properties were not made public. Clivedale owns three London properties: 4, 5 and 6 Stanhope Gate where 18 plush apartments are coming up as Mayfair Park Residences; 9 Marylebone Lane where 22 contemporary apartments are being constructed as The Mansion; and 20,000 sq ft of office space at 73 Brook Street. Along with these three projects, Indiabull’s Hanover Square project is also featured on the website (clivedale.com) of Clivedale (UK). An email to Mossack Fonseca on transferring the ownership of Clivedale (Bahamas) from individuals to “a Trust established by those individuals”. Indiabulls Group official Ajit Mittal, in an email, said there are “no financial transactions or co-mingling of interests”between Clivedale and Indiabulls. Different Clivedale companies are frequently referred to as “a part”, “UK subsidiary”or “the development arm”of the Indiabulls Group in the British media. Tarun Tyagi, CEO of Clivedale (UK), describes himself also as CEO, Indiabulls Real Estate Overseas. He added that Indiabulls, as a listed company, announced acquisition of the Hanover Square property in London. Records of its registered agent MF show that from GBP 50,000 in February 2011, the authorised capital of Clivedale Overseas (Bahamas) increased, in stages, to GBP 250 million by March 2013. Soon after, on April 16, 2013, Clivedale (Bahamas) sought MF’s advice on transferring ownership of stakeholder company Calleis Infrastructure from “individuals, to a Trust established by those individuals for their own benefit (and their children’s benefit)”. The legal team of MF assured that such a change would not have to be reported to the registry in the Bahamas. “Callies Infrastructure was owned by me and my wife Divya Gehlaut up to 2012. SG Family Trust was set up in 2012 as an Indian Trust to hold my family assets for my children and succession planning. The ownership of Callies Infrastructure was transferred to SG Family Trust in 2012. The returns of SG Family Trust and Callies Infrastructure are filed regularly with Indian tax authorities,” wrote Sameer Gehlaut in the email. Since the incorporation of Clivedale (UK) in April 2012, all its shares — 19.3 million at GBP 1 per share — have been issued to Clivedale Overseas Limited (Bahamas). Registered in February 2011, Clivedale (Bahamas) has until now issued 75.5 million shares at GBP 1 per share and the entire lot is held by Calleis Infrastructure Private Limited, registered in May 2011 at New Delhi’s 296 Forest Lane, Sainik Farms. The SG Trust held all shares — except one share held by Sameer Gehlaut himself — in Calleis Infrastructure Ltd worth Rs 9.75 crore but acquired at a premium for over Rs 300 crore. Between June 2011 and November 2015, Calleis Infrastructure invested over Rs 800 crore in Clivedale Overseas (Bahamas). “SG Family Trust is capitalised by me from time to time through my annual dividends of circa Rs 350-450 crores per year. All funds in Callies Infrastructure are only invested by SG Family Trust and by me. All our overseas investments are made under route of overseas direct investments and duly disclosed to RBI as per RBI laid out procedure of intimation through authorised dealer (remittance bank). Right from the first investment in 2011 made by Callies Infrastructure Pvt Ltd, to acquire shares of Clivedale Overseas Ltd, Bahamas, all intimations are made to RBI from time to time,” Gehlaut stated in the email. While Gehlaut and Mittal put the net worth of Indiabulls Real Estate and Calleis Infrastructure at Rs 7,000 crore and Rs 850 crore respectively, they did not specify the net worth of Clivedale Overseas (Bahamas) which owns the London properties through its subsidiaries for the Gehlaut family.